Pack away your curtains in our specially made curtains box, which comes ready assembled, so no tape required. This cardboard box set makes it easy for you pack away your curtains without putting lots of creases into them. 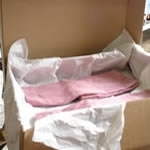 Box comes complete with 100 sheets of acid free tissue paper, to help further the protection of your curtains.